Click here to see the slides for the brain health and dementia prevention presentation given during the 3rd Annual Dallas Police Department Northeast Division’s Safety Breakfast. The Framingham Heart Study is a long-term, ongoing cardiovascular cohort study on residents in Framingham, Massachusetts. The study began in 1948 with 5,209 adults and is now on its third generation of participants. While rates of dementia are falling, the number of adults age 65 and over is growing. The U.S. Census Bureau estimated 40,268,000 seniors in 2010 and expects that number to grow to 83,749,000 by 2050. Multi-infarct Dementia occurs when small vessels in the brain become diseased or blocked, depriving brain cells of the oxygen and glucose they need. (This can happen with high blood pressure!) If enough nerve cells are damaged or killed by the process, memory can’t be restored. 1,400 calorie diet = 10- to 15 grams saturated fat. 1,600 calorie diet = 12- to 18 grams saturated fat. 1,800 calorie diet = 15- to 20 grams saturated fat. Limiting saturated fat, the fat that comes from animal protein (meat, cheese and other dairy foods), coconut and palm oil, takes effort and planning. It also requires the avid reading of food labels to assess saturated fat. Calorie King has a wonderful database of foods where you can look up the amount of saturated fat in just about any food. For example, one ounce of cheddar cheese contains 9.4 grams saturated fat. Harvard Health reports high blood pressure is responsible for 1 of every 6 deaths in the U.S. Stroke isn’t our only fear; elevated blood pressure is a circulatory disease. High blood pressure damages brain nerve fibers – starting in our 40s and 50s. Harvard – Most investigations focus on older adults. For example, a study of 2,505 men between the ages of 71 and 93 found that men with systolic pressures of 140 mm Hg or higher were 77 percent more likely to develop dementia than men with systolic pressures below 120 mm Hg. And a study that evaluated blood pressure and cognitive function in people between 18 and 46 and between 47 and 83 found that in both age groups high systolic and diastolic pressures were linked to cognitive decline over time. The take-home here is that high blood pressure is potentially impacting brain health. Take your blood pressure medications, and work to lower your blood pressure with lifestyle modifications. Mayo Clinic tested patients with nerve fiber damage due to high blood pressure and found reduced nonverbal function, emotional control, decision-making abilities and ability to focus. Lifestyle recommendations can make a huge difference. The top source of sodium in the American diet is bread and rolls. Other foods with deceptively high sources of sodium include cold cuts and cured meats, pizza, poultry, soups, sandwiches, cheese, pasta dishes, and snacks. The servings given on the slide are based on a diet of 2,000 calories. Plans online show servings for 1,600 and 2,600 calories. The U.S. Department of Health and Human Services has this great, free guide Read Your Guide to Lowering Blood Pressure. The MIND diet, which stands for “Mediterranean-DASH Intervention for Neurodegenerative Delay,” was developed by Martha Clare Morris, a nutritional epidemiologist at Rush University Medical Center, through a study funded by the National Institute on Aging. The research was published online in February 2015 and looked at food intake of 923 Chicago-area seniors. Over 4.5 years, 144 participants developed Alzheimer’s disease. The longer people had followed the MIND diet patterns, the less risk they appeared to have. Even people who made “modest” changes to their diets – who wouldn’t have fit the criteria for DASH or Mediterranean – had less risk of developing Alzheimer’s. The study found the MIND diet lowered Alzheimer’s risk by about 35 percent for people who followed it moderately well and up to 53 percent for those who adhered to it rigorously. The normal range for Vitamin B12 is 254-1320 picograms per milliliter (pg/mL) of blood serum, but Cooper Clinic physicians want to see a minimum level of 450 pg/mL. British adults aged 65 years and older with vitamin D levels less than 12 ng/mL (30 nmol/L) were 2.3 times as likely to have cognitive impairment as those with vitamin D levels above 26 ng/mL (66 nmol/L). 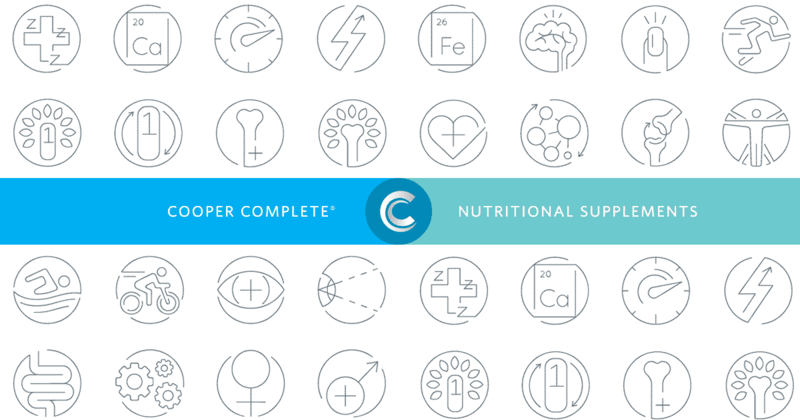 Cooper Complete multivitamins contain 400 mcg vitamin B12. We also offer a standalone liquid vitamin B12 that has 1,000 mcg vitamin B12 per dropper. Older Italian adults with vitamin D levels below 10 ng/mL (25 nmol/L) had a 60 percent increased risk of decline in global cognitive function compared to those with vitamin D levels above 20 ng/mL (50 nmol/L). There was also a 30 percent increased risk of decline in decision making. Adults greater than 65 years of age with vitamin D levels below 10 ng/mL (25 nmol/L) had 4 times the increased risk of cognitive impairment compared to those with levels above 30 ng/mL (75 nmol/L). Symptoms of a vitamin D deficiency can be vague but sometimes include muscle or joint pain, depression and general fatigue. Vitamin D level is determined through a simple blood test which Medicare will cover. If you only take one dietary supplement, take omega-3 fatty acids. Found in fatty fish such as salmon, lake trout, barramundi, tuna, sardines, herring, anchovy and mackerel, omega-3 fatty acids support optimal brain, heart, and inflammatory health. 19,458 participants. Average follow-up 24 years. 1,659 developed dementia. 36% decrease in dementia development in the highest fit vs. lowest fit. The big takeaway on exercise is that small amounts of exercise make a huge difference and that it is never too late to start being active! From an activity standpoint, all movement counts. The National Sleep Foundation publishes sleep recommendations. Research has shown both too little sleep and too much sleep are detrimental to optimal health. Sufficient sleep duration requirements vary across the lifespan and from person to person. The recommendations reported here represent guidelines for healthy individuals and those not suffering from a sleep disorder. Sleep durations outside the recommended range may be appropriate, but deviating far from the normal range is rare. Individuals who habitually sleep outside the normal range may be exhibiting signs or symptoms of serious health problems or, if done voluntarily, may be compromising their health and well-being. We hope these steps on ways to prevent dementia prevention are helpful. If you’d like more health information from Cooper Aerobics, sign-up for our monthly e-newsletter, The Cooperized. Article by Jill Turner, President Cooper Complete.